AMAZING!! Highly Recommend! I found Hellenic Holidays on the knot and was weary as I had this picture perfect idea of what I wanted my honeymoon to be. My now husband and I love traveling but neither of us are great planners. I reached out and spoke directly with Petros, who’s professionalism was immediately noted. We set up time for him to get a good understanding of what we wanted, areas to visit and our budget. Within two weeks he had a detailed itinerary with pictures and options for our trip. From there we were able to nail down the specifics and about 10 days before our trip we had a 15 page detailed document outlining flights, pick up times and excursions. We were able to just show up and everything was done exceeding all expectations. Our entire went honeymoon was as smooth as can be even with travel to visit several areas of Greece. We will definitely use Petros and Hellenic Holidays again! Petros at Hellenic Holidays was absolutely amazing to work with! We let him know where we wanted to go in Greece for our honeymoon in September and he planned the most spectacular trip! He took care of everything for us so we had nothing to worry about while we were there. We would definitely book another trip to Greece through Hellenic Holidays! Wanted to thank you again for coordinating such a great trip. We all had the best time and it was smooth sailing all the way. Hotels were beyond our expectations and Loved, Loved, Loved the food, culture and people we met along the way. Petros planned us the best honeymoon ever! For our honeymoon, we knew we wanted to do Greece but didn’t know specifics. That’s where Petros came in. He walked us through all of our options for different Islands, and from there hotels. We ended up doing Athens, Mykonos, Naxos, and Santorini. Petros did an incredible job of planning our honeymoon from start to finish. As a bride, I had enough to plan with the wedding so to be stress-free about the honeymoon was priceless. Petros arranged all the transportation once we got to Greece, activities, recommendations for Meals – everything was just amazing. Whenever we had to leave for the next stop, someone was waiting to pick us up or drop us off. It was a seamless trip. Petros also had us add him on WhatsApp and he was available for questions throughout our whole trip which was really nice! Overall, I can’t say enough good things about Petros. He gave us the Greece trip of a lifetime and we will definitely use him for next time we go back! You’re in good hands with Petros and Hellenic Holidays! My wife and I booked our honeymoon through Petros and he did an amazing job in designing our itinerary. He is extremely knowledgeable about all things Greece and was able to answer all of our questions until we felt comfortable that our itinerary was tailored to our vision. The final itinerary we received was so detailed and included amazing restaurant suggestions and super fun excursions. Every hotel we stayed in was absolutely fabulous and we felt like rock stars in all of them. Everyone knew him and spoke so highly of him! Our favorite part of the whole trip was the sailing trip in Santorini, so much fun and the food was SO GOOD! Efharisto Petros! We highly recommend him to everyone and hope to book another trip with him in the future. Petros planned the most amazing honeymoon for us. He really listened to all our wants and needs and was easy to communicate with. The final itinerary was so detailed and included many great restaurant suggestions and things to do. Every hotel we stayed in was in a great location (Athens, Mykonos and Santorini) and we felt so special in all of them. We couldn’t have found better ones ourselves! All our transfers were seamless and it was reassuring to know that Petros tracked our trip to make sure everything ran smoothly. We had the best time and we have Petros to thank! We highly recommend him to everyone and hope to book another trip with him in the future. Petros planned us the most incredible honeymoon. Everything was taken care of from start to finish and we felt so pampered throughout! We explored Athens, Mykonos, and Santorini and each hotel had such a fantastic view, ambiance, and amenities. He went above and beyond to get us great experiences and they were all catered exactly to what we personally wanted to do. It was such a pleasure working with him and I highly recommend him to anyone. We’re hoping to book a similar trip back to Greece for our ten year anniversary. Thank you Petros! Petros was simply incredible. His responsiveness, thoroughness, and knack for making things just a little “extra special/personal” are second to none. Vacations/Honeymoons to Europe are expensive, but his local relationships helps manage costs without sacrificing quality. He also went above and beyond in adding personal touches to our honeymoon. Every hotel seemed to know it was a special occasion and we felt taken care of everywhere we went because of Petros! We couldn’t recommend him more. My husband and I used Hellenic Holidays for our honeymoon to Greece in July. Petros was such a pleasure to work with! He made the process of planning our honeymoon a breeze from start to finish. He is so knowledgeable and was so helpful even while we were there he made himself available to us if we had any problems or concerns. We had such an amazing time! Everything from the hotels to the transportation and activities he planned were on point! Thank you so much Petros for giving us the honeymoon of our dreams!!! Words cannot describe the incredible job Petros did for my wife and I. From the first time I spoke to him I knew he was the right person to guide us. The final itinerary he sent us was extremely detailed. It gave us many different options every day as well as great restaurant recommendations. When we were in Santorini we were scheduled to go on a boat the next day. Petros called us lo let us know that it was going to be very windy and would arrange for us to reschedule. That is the kind of thoughtful person he is. 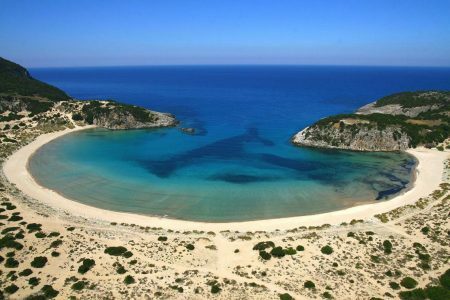 If you are planning a trip to Greece Petros and Hellenic Holidays is the only way to go. There aren’t enough words to say how amazing Hellenic Holidays is! Petros is so knowledgeable about all parts of Greece and worked to create the perfect honeymoon itinerary to meet our needs/ requests. His recommendations for activities and restaurants were spot on. We truly felt like we were getting an authentic Greek experience. Petros was so accessible and was always ready to answer all our questions. The hotels he booked for us were beyond reproach and the level of service we received was flawless. Petros truly made our honeymoon unforgettable and we will definitely use Hellenic Holidays again! Petros of Hellenic Holidays set everything up perfectly, and this vacation was the best we have ever had. Each hotel was top of the line, and the activities were planned on alternate days to give us days to relax. 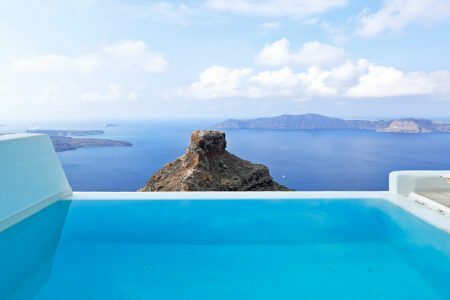 The Andronis Concept in Santorini, with each room having a private infinity pool out back and a view overlooking cliffs and water, was indescribably beautiful. Petros knows Greece very well, and can answer all your questions about the atmosphere and activities on each island. Definitely will go back to Greece but I would not book this through any other agent. This was the best vacation we ever had. Petros organized everything perfectly. All the hotels were first rate and very well located, all the activities he recommended were perfect, the exchanges went smoothly, and everything went like clockwork. We could never have done a complex vacation like this on our own so we were incredibly fortunate to find Petros. He was expert at knowing how a vacation like this needed to be done and doing it. Petros was absolutely amazing from start to finish. I cannot say enough wonderful things about our Honeymoon! It was a dream come true. He listened to me on the phone for well over an hour about the types of vacations we enjoy and then planned a perfect trip for us. We had someone greeting us at every stop, and it was clear Petros has amazing relationships with the hotels we stayed at. It was so nice not worrying about a thing in regards to Honeymoon Planning. We look forward to hopefully using him again in the future! My husband and I were so busy planning our wedding and we wanted our trip to Greece for our honeymoon to be a trip of a lifetime. I was a bit hesitant at first to work with a travel advisor that I couldn’t meet in person, but Petros put me at ease after my first phone call with him and after seeing the initial itinerary he put together for us. He answered all our questions and was extremely attentive to detail and very responsive. He has traveled to Greece so many times, so had a personal experience with every hotel, restaurant, beach, excursion, and trip that he either planned for us, or recommended to us. Our trip consisted of 1 night in Athens, 4 nights in Santorini, 3 in Naxos, and 3 in Mykonos. All we had to do was book our trip to and from Athens and Petros took care of the rest. It was such a breeze traveling from one island to the next along with having all of our transfers pre-arranged to get us to and from the hotels. Petros knows what he’s talking about and I would highly recommend him to anyone planning a wedding to take some of the added stress away so you can just relax and enjoy your honeymoon! Hiring Petros was the best decision my husband and I made when booking our honeymoon! We didn’t have to stress or worry about a thing leading up to the trip. He does all the leg work, you just have to show up (with the extremely detailed itinerary he makes for you). Petros helped us design a custom trip that was romantic, magical and unforgettable. Petros is caring, detail-oriented and passionate about his career and all of his clientele. He makes you feel special and takes his time to develop a unique trip that fits your personality and interests. This isn’t like ordering off a menu. Petros is your personal chef and will cook you up a trip that fits your desires, interests and budget. Speaking of budget, Hellenic Holidays is worth every penny! You couldn’t book a trip yourself cheaper than what Petros can offer. What sets Petros apart is that he travels to Greece every year to foster business relationships and create new ones. He’s constantly raising the bar for his clients. He wants to find the best hotels, the best tour guides and the best restaurants to give YOU the best experience! You really see it when you’re experiencing those things yourself and when you meet some of the people Petros does business with. They all say the same thing, Petros is passionate about what he does and the people he works for. When you think Petros couldn’t impress you any more, he does. He’s always raising the bar, remember? I’m talking champagne in your room, upgrades along the way… you can’t get those special treatments booking on your own. When you arrive in Greece, you’re treated like kings and queens. We were so happy with our experience that we’re planning on booking another trip with Petros in 2019. BOOK WITH PETROS! You won’t regret it! We went to Athens-Crete-Santorini, and I can honestly say it was the best trip ever!! We had a spectacular honeymoon! Petros was extremely knowledgeable of the area/restaurants/activities at each place. All of his recommendations were fabulous! He was so easy to work with and created a honeymoon tailored just for us (best combination of relaxation/travel/excursions). The hotels were all top of the line and exquisite. They were also in the most convenient places at each location–easy to walk to anything! Petros provided such a detailed itinerary loaded with lists of recommended restaurants and activities that we always had something to do. Traveling from one place to the next could not have been any easier with private transfers/first class ferries. I would HIGHLY recommend Petros to anyone traveling to Greece! Petros at Hellenic Holidays set up our vacation of a lifetime and that it was. Every stop was beyond our expectation. Two nights in Athens at the five star Hotel Grande Bretagne was superb….we cannot say enough about the rooftop restaurant & bar with views of the Parthenon…a night cap at the rooftop bar was a must each night. The private guided tour of Athens was excellent and we learned more than we could have imagined. We took a flight to Mykonos and stayed 3 nights at the Myconian Ambassador overlooking the Aegean Sea with its brilliant blue colors. Then a high speed ferry to Santorini with its majestic views at the Andronis Concept with your own infinity pool looking out over the bay carved into the cliff side above the magnificent Caldera was breathtaking. George and his staff took care of us like family and we would highly recommend a stay with them. The sailing with Captain Ted’s crew was a memory of a lifetime…..Petros we cannot thank you enough for all the connections and the people were just so friendly everywhere we went……Thank You, Thank You , Thank You!!! Petros at Hellenic Holidays went above and beyond our expectations for a vacation to Greece! He arranged everything perfectly to meet our wishes for a birthday trip for my friends and me. We stayed at the excellent Electra Palace for two nights in Athens with views of the Acropolis. We were near a wonderful shopping district and had the most knowledgeable private guide to the Parthenon! Next we flew to peaceful Naxos and stayed at the incomparable Naxian Collection where we were treated like royalty by Maria, Yannis and their fantastic staff! Finally we took the high speed ferry to Santorini with its breathtaking views. We stayed at the amazing Astra Suites with a caldera view, perfect sunsets and George and his 5 star staff meeting our every need. The tour of the island with Blue Shades of Greece, wine tasting at Domaine Sigalas winery and catamaran sailing trip with Captain Ted’s were so perfect! I must say the food at these three establishments was world class and beyond excellent. Petros arranged ALL of this for us to create the trip of a lifetime! I cannot recommend him and Hellenic Holidays highly enough! Thank you again for putting together the best honeymoon anyone could ever imagine!! Rem and I loved every moment! Santorini was absolutely breathtaking, but we also have a huge place in our hearts for the Mykonos Grand! They treated us like family and we had such an amazing time all over the island! Rem and I already plan on going back in 3-5 years and planning with you again! So Thank You Thank You Thank You! 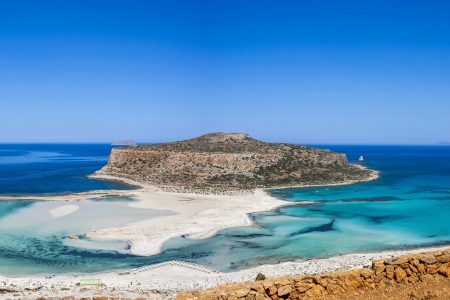 I had the pleasure to work with Petros to plan our trip to Greece. From our first conversation, he was friendly, helpful and knowledgeable. Our trip exceeded our expectations. We are home, but if I had a chance to do it all again I would get on a plane this morning. The hotels were wonderful and all transfers/connections/tours/sailing were excellent. The view of the Acropolis/Parthenon from the Electra in the evening was surreal. As we walked downward toward the Astra Suites…felt like we were in a dream. The location and views were amazing. Everyone we encountered was professional, friendly and helpful. We tried a number of his restaurant recommendations and were always happy with the food and service. Our honeymoon was amazing! I can’t stress enough how incredibly helpful Petros was and how responsive he was. Thank you for a wonderful trip. It was perfect! I am emailing to nominate Hellenic Holidays – Petros Zissimos – for a top travel specialist for Greece. I traveled to Greece with my family (all adults) and the trip was incredible. He planned all the transfers, times, and dates perfectly for the amount of time we wanted to spend in Greece. All of the hotels were memorable and we felt like royalty the entire trip. His connections allowed us royal treatment in Greece. We traveled to Athens, Mykonos, and Santorini in the best way possible. He is definitely a top travel agent and should be known for it. Thanks and have a nice day. Petros is Incredible!! He made sure we had the best honeymoon anyone could ever ask for! We went to Athens, Mykonos, and Santorini, and he made sure every time we stayed at an amazing hotel with the perfect location for us. All the transfers, and excursions were set up for us, making life extremely easy. Every time we got in a hotel room there was some delicious treat waiting for us. He even got us upgraded on the ferry. Restaurant recommendations that he gave were super helpful and delicious. He made us feel like celebrities our entire honeymoon, and gave us the best trip of our lives!! I definitely recommend Petros! I was looking into other travel agencies for our honeymoon, but Petros won me over. From start to finish Petros is literally on top of everything! A week before your trip, he will go over specifics, recommendations, etc. so you’re prepared for the trip. You’ll feel like you’re connected to him at all times if there was a problem to rise up during your trip because he tells you to message him through Viber. Before our honeymoon I asked him if we could have a specific room number at one of the hotels and I literally asked him last minute and I didn’t think he could accommodate it since it was last minute and he said he can’t guarantee it. I didn’t get my hopes up because I would’ve understood. BUT when we got there we got the room I wanted! I then messaged him on Viber and he said it was a surprise! So I thought that was really sweet of him and how much he cares about his clients. We went to Athens, Crete, Santorini, and Mykonos. All the hotels he set us up in we’re amazing! He is VERY organized and like I said is on top of everything even coming down to boarding passes for every flight/ferry/speed boat. Thank you Petros for a memorable honeymoon! I would recommend Petros to anyone going to Greece – for their honeymoon or otherwise. He was extremely helpful as we were planning the trip, consulting us about our preferences and providing a thorough itinerary before we left. I can easily say the honeymoon was the least stressful part of planning the entire wedding. When we arrived in Greece, Petros took care of EVERYTHING. Each place we stayed was stunning with incredible service. The restaurants and suggested activities gave us great options but did not make us feel too scheduled. Finally, his availability throughout the honeymoon – checking us into flights, being there via text if we had any questions – was very helpful. Although, we didn’t end up having many questions, since he prepared us so well beforehand, it was reassuring to know he was there. Our honeymoon was incredible thanks to Petros!! !